But what exactly was happening? Did new economic opportunities lure workers off farms or did changes in farming lead to industrialization? Jacopo Ponticelli, an associate professor of finance at the Kellogg School, along with University of Zurich economist Bruno Caprettini and Paula Bustos of Spain's Center for Monetary and Financial Studies, suspected the answer had something to do with soybeans. In 2003, Brazil legalized the revolutionary Monsanto's Roundup Ready soybean seed. The seed (called "Maradona soy" in South America after a famously agile soccer player) had been genetically engineered to be herbicide resistant. "We wanted to test the theory that an increase in agricultural productivity can get this process started," he says. In a pair of papers, Ponticelli and coauthors trace how businesses across Brazil reaped the benefits of this revolutionary seed. In the first paper, the researchers find that the seed freed up farm laborers to find other jobs, allowing Brazil's industrial sector to grow. 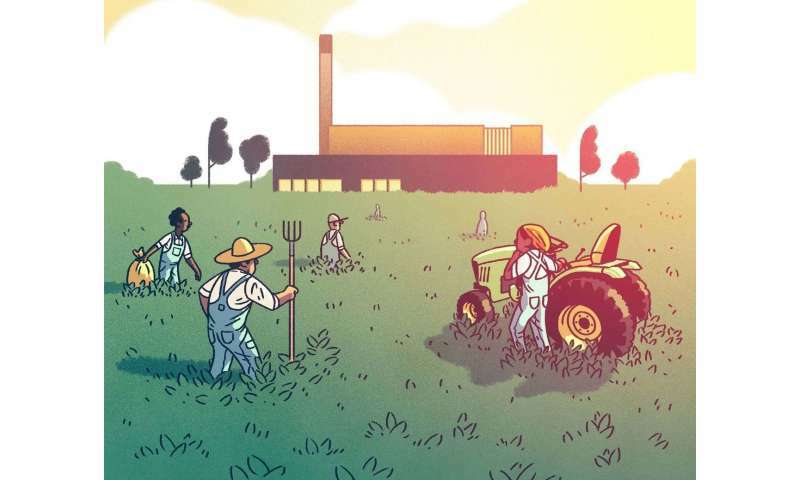 In the second, the researchers find that the seed helped farmers put more money in the bank, which led to urban centers getting access to cheaper credit, allowing banks to finance more manufacturing and services firms. "If we think the manufacturing sector plays a key role for economic growth in the long run—because most of the patents, the R&D, the innovation happens there—then new agricultural technologies are not bad news, necessarily," he says. Brazil's shift from agricultural labor to industry is not unique; it's a pattern that has played out in growing economies from England during the Industrial Revolution to modern-day China. Economists offer two competing explanations for why—what Ponticelli calls the "pull" and "push" theories. In the "pull" theory, a growing economy increases incomes, meaning consumers can afford to buy more manufactured goods. Additional industrial labor is needed to meet this new demand, so the industrial sector "pulls" workers away from agriculture with the promise of higher wages. In the "push" theory, however, change begins when a new technology makes agriculture workers more productive. Since less work is required to produce the same amount of food, farm laborers are "pushed" out of agriculture and need to find jobs in the industrial sector. The case of Brazil presented an excellent opportunity to distinguish between which theory was at work. Brazil's economy grew by more than 40 percent between 2000 and 2010, thanks largely to rapid growth in the manufacturing sector. If increases in agricultural productivity had led to industrialization, then soy-producing regions should have seen higher fractions of their labor force move into other sectors after the introduction of Roundup Ready seeds, as soy-farm workers were freed up to do other work. If instead industrialization "pulled" workers away from other industries, there should be no meaningful differences between migration patterns in soy-producing regions and elsewhere. The researchers used data on weather and soil characteristics to determine how much additional soy output each region of Brazil stood to gain from the Roundup Ready seed. Then, using census data, they analyzed how each region's workforce changed in the seven years after the seed was approved. What they found seems to support the "push" theory. "Areas that are more likely to adopt this technology experience a decrease in the share of people working in agriculture, and an increase in the share of people working in manufacturing," Ponticelli says, "which suggests people are moving from one sector to the other." Roundup Ready soy not only slashed farmers' overhead, it also increased their land values. The upshot: "A lot of these farmers got richer," Ponticelli says. As farmers deposited their newfound wealth into savings and checking accounts, banks suddenly had more cash on hand, allowing them to extend more loans to help businesses grow—"another way in which agricultural productivity can generate development," Ponticelli explains. Ponticelli explains the logic behind this pattern: "You can think of a branch in a rural area that has more deposits because there are all these rich farmers, but there are not that many investment opportunities," he says. Meanwhile, a branch in downtown Sao Paolo may be surrounded by tech companies and manufacturing plants but lacks the cash to finance them sufficiently. "So you can see how there could be a flow of capital from the rural areas to the urban areas." But this uninhibited flow of capital between places (what economists call "financial integration") did not benefit everyone equally. Ponticelli points out that rural businesses would have liked cheap credit too. "Financial integration can be great if you're a destination," he says. "It can be not so great if you're a place that mostly funnels resources into the system but doesn't receive that much back." "We know that a lot of knowledge spillovers, a lot of innovation, doesn't come from the agricultural sector," Ponticelli says. "It comes from manufacturing. I mean, Apple is a manufacturing company." However, Ponticelli notes an important caveat: in a yet-unpublished follow-up paper with Bustos and Joan Monras of Spain's Center for Monetary and Financial Studies and Juan Manuel Castro Vincenzi from Princeton, he takes a closer look at where displaced soy-farm workers end up, and finds that many end up in relatively low-paying, unskilled manufacturing jobs, not the cutting-edge industries where research and innovation generally occur. For example, in the 1980s, Brazilian maize farmers found ways to add a second planting season to the year. Yet Ponticelli, Caprettini, and Bustos find that because the method was very labor intensive, maize farmers were not pushed into industrial jobs. Maize-producing areas "actually experienced an increase in the share of people working in agriculture, and a decrease in the share of people working in manufacturing," Ponticelli says. To Ponticelli, the contrasting stories of maize and soy demonstrate an important point: "There's not one single answer that, 'More agricultural productivity is bad because it locks you into this one, less innovative sector,'" he says. "It really depends on the kind of new technology that you adopt." The nuanced research comes at a pivotal time, as Roundup Ready soy and other genetically modified seeds continue to explode worldwide. Despite controversy over the seeds' environmental impact, the use of biotech crops has been approved across South America, China, and India. "The next frontier is likely to be Sub-Saharan Africa," he says. "Trying to understand, 'What are the consequences of these new technologies on industrialization?' is going to be really important looking forward."